RESET volunteers love sharing what they know with children, and this is one reason the program continues to be so popular with schools and students. Although we certainly want children to learn something new and improve their academic performance, we mostly want them to have exciting early engagements with hands-on science. RESET may be the first time many of these students have had an enjoyable, non-threatening experience with science and math. You have the opportunity to change their negative attitudes toward these subjects forever. Before your classroom visit, try a dress rehearsal or “dry run” of your experiment (especially if it is your first time) with a family member, friend or a child who is the same age as your students. Check your equipment before your class visit, especially if it has been in boxes all summer. Replace light bulbs, check your circuits, and replenish expendable supplies. Use diagrams on the board, handouts, or slides (if a projector is available) that are prepared in advance. You and the teacher will work out the logistics depending on whether you will do hands-on work that day or a demonstration. Sometimes classroom aides are available to help set up the experiment “props” and distribute materials. It is often helpful to provide the teacher in advance with a vocabulary list of terms that you will be using during the experiment. Remember, simple words such as resistance, pulley, and averages, as well as more complicated terms such as density, induction, and polymer, may be foreign to your students. Try to limit the number of unfamiliar terms to a maximum of about 4 to 6 per session. Some teachers will assist you by reviewing the terms with the children before or after your session. Start each class with a five-minute icebreaker activity. Open up the class with a few minutes of informal conversation about current events, a student’s personal interest, or a question related to last week’s exercise. Review the previous sessions’ vocabulary terms and introduce them in the following session. Break the class into small groups or assign tasks to pairs of students. Before you begin, tell the students what the experiment is about and what kinds of activities they will be participating in. Hold up key materials they will be using for them to see. Children feel more secure when they have a clear sense of direction and what the expectations are. Also, if your experiment involves unexpected noises, flashes of light, or unusual smells, let the children know beforehand. Some children can be very disturbed or frightened by such experiences. Without “giving away the punch line,” try to keep the learning environment relaxed and trusting. If possible, avoid distributing materials to students and groups until it’s time to start using them, as students’ attention will shift away from you to the materials when they have interesting objects in front of them. Assign students specific roles during an experiment. (This gets them accustomed to behaving and thinking like scientists.) For example: one volunteer who conducts an experiment on drawing polymer fibers assigns one student to mix the solution, another student to draw the fiber, and a third to observe and record the results. Make sure you take time during your program to tell your students what initially sparked your interest in science and math; describe what kinds of scientific advances and inventions occurred when you were their age. Also, describe the kind of education you had and the opportunities that you and others in your field tackle on the job. 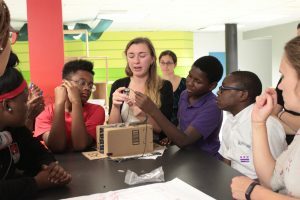 Students develop a strong connection with their volunteers over the course of a RESET program, and sharing such information enhances their image of you as a role model. Use non-verbal cues of encouragement. Smile expectantly, make eye contact, nod while a student is talking, look relaxed and interested, and address students by name. Casually stand next to students who don’t typically contribute, as it will often draw them out. Make sure you reward an infrequent contributor with a warm smile or spoken affirmation. The most intelligent students are often the most quiet. They may need a little more time to feel comfortable with you. Encourage questions and be positive in your answers. Comment affirmatively about a student’s contribution, even if it’s the wrong answer. Many answers show good critical thinking and imagination, although they may be “technically” incorrect. Reinforce the positive aspects of these answers, and let them know it’s ok to be wrong. It’s your job to guide, rather than dictate. Correct wrong answers tactfully. Instead of reacting negatively to an incorrect response, provide hints, suggestions, or follow-up questions that will enable students to correct their own answers and continue to learn. Provide clear directions and ask questions to gauge whether you are expressing yourself in a manner that the students understand. You are a role model, so always demonstrate good safety practices, fairness, patience, and attentiveness. When children see this behavior in you, they will be encouraged to exhibit it themselves. To better connect parents and guardians to the child’s hands-on science/math program that you are providing, RESET encourages volunteers to provide each child with supplies for one experiment to take home (at a cost of $5.00 or less per student). Limit your own remarks and avoid the temptation to turn a discussion into a lecture. Try to dialogue with the students often and have them spend as much time as possible in the experimental activities. When students are caught up in the excitement of an experiment, it can be challenging to quiet things down so you can make a point or move forward. Try a technique that requires them to shift their attention to you. Perhaps start counting to 10 forwards or backwards and have all students join you in the counting. When they reach ten (or 0), quiet is expected. Asking for hands in the air or on the table will shift their attention away from the materials with which they are working. Rhythmic clapping, ringing a bell, and flicking a light switch are also excellent ways of getting students’ attention. At the end of your session, suggest that the children think about the experiment they have done and write down questions that you can discuss together at your next meeting. Consult with the teacher about whether the school uses the scientific method and, if so, which variation of the steps and terminology that they employ. Align your experiments with those steps where feasible. When a student answers a question, remind others in the class to be quiet and listen. Let the students know you will be asking other individuals to repeat another student’s correct response, and do that regularly to promote their paying attention to questions and answers. Relate the experiment underway to things that students will recognize in their everyday lives. The best lessons are those that are inquiry-based, hands on, and get everyone involved! Try to ensure that each student in the class has tasks to perform during the session. Numbers can be assigned to each student in a group (perhaps by distributing them on index cards) and tasks can be assigned by number. Even having a student from each group come up to you and take back materials or handouts to distribute to others in their group is an activity many like to do. Try showing a task to one student from each group and have them return to their group and show the others how to do it. Peer teaching is a great way to learn. Write a student’s answers on the board or refer back to a student’s correct answer later in the class. Reinforce the idea that there are many things that scientists, technologists, engineers, and mathematicians don’t know, and that their jobs often involve trying to find the answers to such things not yet known. Note that science experiments help with that learning, even when they don’t always turn out the way we thought they would. Be open about saying that you don’t know the answer to a question; instead, talk about how one might go about finding the answer. One advantage of this is that it shows teachers that it’s fine to respond to a science question with: “I don’t know.” Some teachers are science-averse because they feel they need to have the answers to all possible questions students may ask. Those without a strong science background may also find the idea of having a highly credentialed STEM professional in their classroom somewhat daunting—let them know there’s still a lot we all can learn. Illustrate with stories and amusing anecdotes—children love them! Talk to students in the same way you would talk to your own child or a niece, nephew or grandchild. If you are unsure whether you are talking above or below your students, ask your assigned teacher for pointers. The teacher you work with can help you adjust your vocabulary so that it is appropriate to the age group you are working with. End the class session with a thought-provoking question to think about before you meet with them again. You might make that question the focus of your next week’s icebreaker. Make sure this is a fun and interesting question that they might discuss with their family and classmates afterwards. Download the complete Volunteer Handbook now ».